Well, I pretty much holed up in my craft room for my 3 day weekend. I made 5 pairs of different sized hoop earrings and a bunch of fine silver rings..on top of 5 pairs of earrings and 3 necklaces...one of which is still in the working process. Until next time ~ Happy Beading! Haven't felt like posting much...my work has got me pretty bummed this week and I just don't feel like doing much of anything..which includes creating any pretties. It's just one of those weeks you feel like crawling under the covers and staying there.I'm hoping maybe my brother in law will perscribe me some good happy pills...if not, I think I might need to invest in a good marguerita maker. Been playing with the torch again..yep..the creme brulee one *wink* the one they told me at the bead store wouldn't get hot enough to melt fine gauge silver...the one that has burned the hair off my knuckles....I'm here to tell ya girls...don't waste your money on a fancy one...this one works great! Today I got out the 12 gauge fine silver and wrapped it around my ring mandrel a few times...made my jump rings about what I thought would be a good ring size and torched away. After fusing them, I got out my handy dandy jewelers anvil and started hammering away. Now I have 6 awesome rings!I almost don't want to sell them. Guess I need to head back to monsterslayer for some fine silver. I think they came out pretty cool! What'cha think? 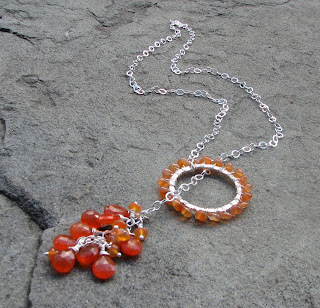 Made a beauty of a carnelian lariat too...starting to get some into wire wrapping. I'm not perfect yet, but alot better than my first attempt! ...now I have that song in my head..It's a country song, so I'm sure I'm the only person on the planet that knows which song I'm talking about! But anywho...this is my town ..York ,Pa. Hubster and I went on a walk in the city a few weeks ago and I've been meaning to share, but time just flies by! York County has played a proud role in the long exciting drama that is the history of the United States of America. York County can justifiably be called the first proving ground for a westward flow of settlers that did not stop until checked by the waters of the Pacific. It was in the forefront of organized resistance during the American Revolution and a source of strength to the Union armies during the most critical period of the Civil War. In more modern times, its citizenry has made notable contributions to the victory effort in two world wars and numerous armed conflicts. Over the past 250 years it has utilized its resources to create a community nationally admired for its agricultural richness, industrial vigor and cultural enterprise. Opening on December 11th, 1888 York's Central Market house is still operating and full of the counties farm produce and crafters wares from all over the area. This is one of many painting done on buildings around town . This one is to honor all the military people from York. Many old historic places are still open in the city and open most of the year to tour groups. The Colonial Complex is the largest historical area still standing.The next few are just shots of the the complex and gardens (since I'm a garden nut)This is the Gates House that is connected to the Plough Tavern. The place on the right is the Plough Tavern in brick and tudor and the one on the right is Gates house in stone. The Plough Tavern, built in 1741, presents the significant role a tavern played in a community as hotel, restaurant and source for news and housed Congressional delegates. The Gates House (c.1751) reflects the year 1778 when General Gates occupied the house while the Continental Congress met in York and was the setting of the Conway Cabal Meeting in which the overthrow of Washington as commander was prevented. The Bobb House, built with squared timbers, shows family life in the 1830s and acts as an example of a frontier house. Lastly just some more paintings in the city I thought were really neat. The first one, you can read a funny story about the squirrel hunt in 1824. Made lots of pretties on my 3 day weekend...house isn't cleaned, laundry isn't done ...but damnit I made some things! 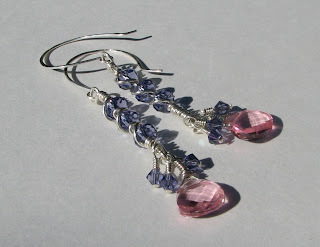 This one is inspired by my sweet internet friend Christie who loves jem stones I'm told :) I got into my stash *big sigh*. I know I have to part with some... This is my first gold piece. It's 18 gauge hammered gold filled wire. 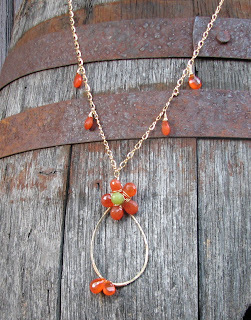 I used some of my much beloved carnelian briolettes with a jade briolette for the center. I'm not sure if it's too "cute"... 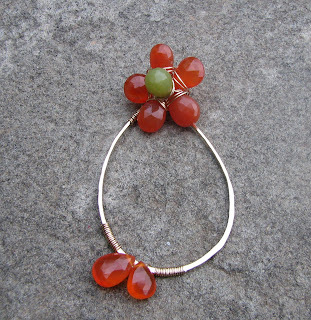 I've been on a flower kick since I saw the Karla Cam from Aunties Beads. Just need to get some chain for this one and it will be done. This is another weekend creation that I'm pretty proud of too...took forever to wire wrap all that fine gauge silver! 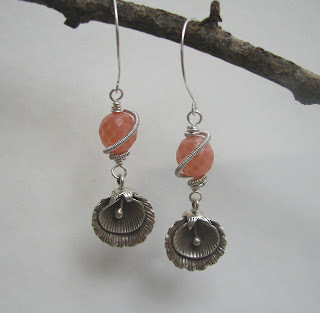 I won't bore ya with all the rest..if you would like to see them, stop in my shop anytime! Until next time~ Happy Beading! Next is a set of long tweezers...these are a must have to hold the metal as it gets extremely hot!I bought these at my local bead store for a grand total of $3.50. I'm sure they are easy to find on ebay or Rio Grande if you have an account with them. Next is a firing brick. 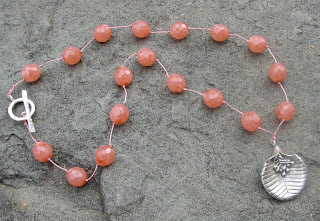 I also bought this at the bead store for $5.75 but can be found online. 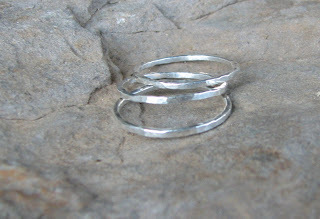 They are sort of soft so you can make a gouge in it to hold your metal when you are fusing rings.And one of the most important things...22 gauge fine silver. This is relatively inexpensive at around $1.50-$2.00 a foot depending on where you purchase it. If you are going to be working indoors, I would strongly suggest you put an old cookie sheet under the firing brick.The very last thing you will need is some sort of bowl with water. After you use your torch and make a headpin or fuse something, you want to dip it in the water to cool it. Well, by now I'm sure you know I'm alittle different than most :) Different is good I think LOL! 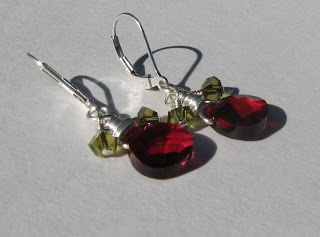 I don't like a boring old strung on a headpin earrings, although I have made them before when I had my first custom order. You never know what someone is going to like so I made a whole mess of earrings so that the customer would have a choice. I haven't gotten great pics of the new ones yet...just a few ok shots so I won't list them until I'm happy with atleast 3 pics of each to list in my shop.Here are a few pics of the ones I've done the past few days just to see what a'll think. 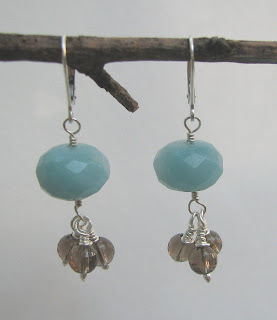 Handmade ceramic beads with bali spacer on handmade earwires. Blue handmade ceramic beads with bali swirl spacers on handmade earwires. 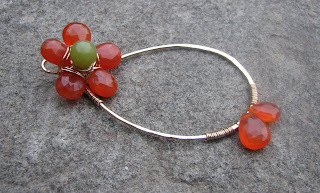 Jade and rhyolite briolettes wire wrapped on handforged hoops and earwires. 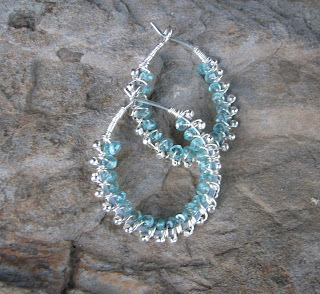 Pyrite in amazonite with caribbeanblue and light azure swarovski crysyals with bali headpin and handmade earwires. Good ol' sterling silver hoops! I'm off work on Friday (I've decided to give myself another holiday day) Gping to the bead store to pick up my tweezers for the head pin demo that I haven't forgotten about...just busy! So stay tuned for that one. I've just been featured on Talent database!!!!! Holy cow I could pee my pants!! Here's the link to the page Fashion I'm in the top left corner of the featured box. I don't know how they pick you, but I got an email in my box from them saying I was a featured artist. Now I can finally say I was featured somewhere!!! Ok...that was just a quick post to share my good news!! I would take a pic of it, but I don't know where my screen shots are ending up on my pc... Hope everyone had a wonderful holiday! So I would really like some feedback on what everyone thinks ..I don't even have a clue as to what to price it at?I like it so much, I'm tempted to keep it! 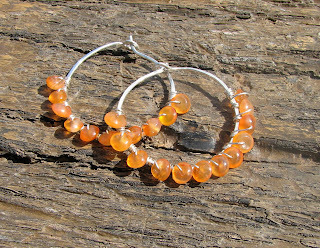 Right now, I'm working on making some sterling hoops...who doesn't love hoops and I'm an 80's girl after all!